Faber is a native of Moscow who now lives in South Africa, and she wryly tells stories of her time behind the Iron Curtain before it collapsed. She says she worked for a “secret Soviet agency” and a Russian-based newspaper where she wrote about travel and new automobiles. She even got behind the wheel and tested many of the new vehicle designs. These days she’s doing her traveling by bike. She then admitted she doesn’t know anyone in Santa Monica but she hopes to meet some new friends, as she’s done throughout her trip. 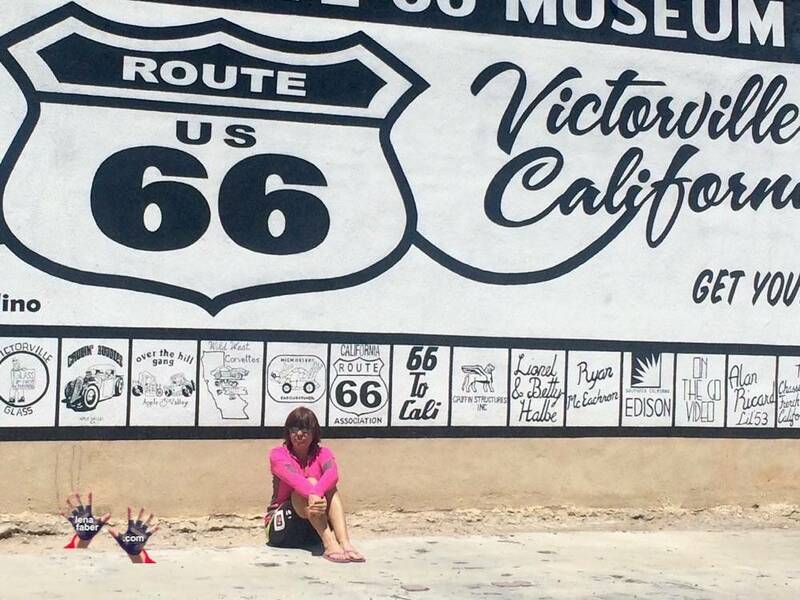 As a group of curious people gathered around Faber at the Route 66 Museum, Faber said her book, “Folks’n Route 66″ will be filled with photographs and stories of the things she’s seen and the people she’s met along the way. Faber, who has two children in their 20s and says she’s in her “30s plus,” is not trying to set any speed records while traveling the nearly 2,400 miles of the historic Mother Road. Faber said local museum board member Delvin Harbour was one of many people that she’s met along the way who provided local transportation, food, drink and a place to rest. According to the museum staff, approximately 700 visitors come through the doors of the 4,500-square-foot museum each month, coming from as far as Australia, Britain, China, Germany, Japan or New Zealand. Bridges said the museum staff of volunteers and sponsors are already gearing up for the museum’s “20th anniversary Birthday and Car Show” on Oct. 24. According to Faber, her biggest challenge since leaving Chicago was being sidelined for about a month after she was bitten by a dog in Oklahoma. Her other major speed bump was enduring the sweltering heat of the Eastern Mojave Desert. Faber said she’s a big fan of McDonald’s because of its food, clean bathrooms, drink refills, WiFi and electrical outlets to recharge her phone and MacBook. Besides writing her book, Faber said she’d love to see her biography turned into a major motion picture, with Sandra Bullock playing the lead role. To follow Faber’s journey, visit www.lenafaber.com/blog or www.facebook.com/journalist2. The California Route 66 Museum is located at 16825 South D St. For more information on the museum, visit www.califrt66museum.org or call 760-954-1903.